Please meet our third wrap of the collection “Clichés” – Marina Pirate! It is our third pattern and the first nautical-inspired one at the same time. 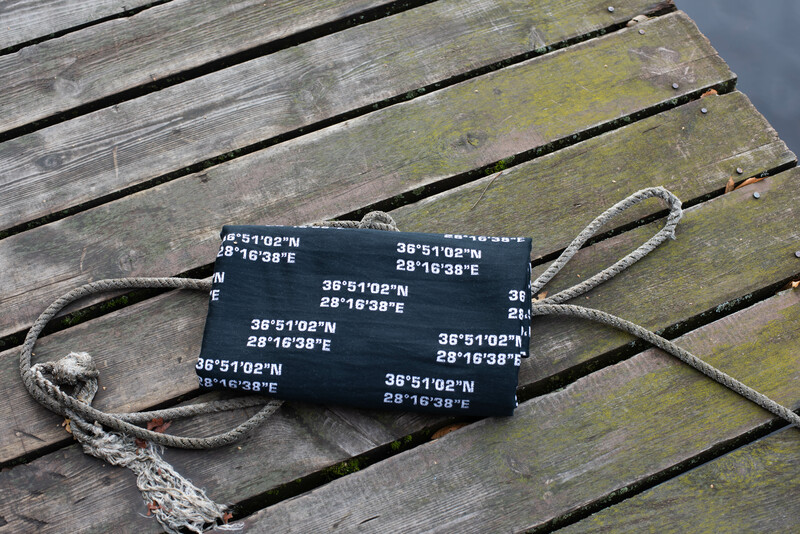 Coordinates are a usual motif for sailing clothing and accessories. Their appearance on MainSling wraps was quite logic. But it took some time to make a decision about the point which coordinates to place on our wraps. And I chose Netsel Marmaris Marina, Turkey, where my first sailing voyage (yacht delivery actually) finished. It was the most imressive, the most difficult and the most educational voyage for me. (“The first time? And such a tour?” the skipper asked by meeting a crew.) I have chosen the finish point not the start one because my husband had his RYA Skipper training and got his first skipper certificate there so the place is important for both of us. Here is a link to a review of our Montenegro – Turkey sailing tour written by Mikhail Verpatov, one of our crew members (in Russian only): http://nmiles.ru/node/198 With some artistic embellishment ) I did not spend all the time in my cabin! I only passed the second night watches – because I was not very useful and it was quite distressing. The pattern is perfect for dads. And for mums’ sport shoes. Do you often wear sport shoes? I did during my first babywearing year. Marina Pirate is woven tight and needs some breaking in. But due to high qualified ELS cotton and Italian combed cotton yarn with loose twist it is soft and airy from the very beginning.